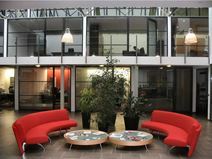 Office Space - Charleroi, Hainaut Province. This impressive business centre has been designed and renovated to create a comfortable working environment providing clients with a choice of office spaces. The building also provides conference and events rooms, private parking and virtual offices. Located south of Brussels and close to the city of Charleroi it is just a short distance to the Charleroi Airport and the E42 motorway. Just a short drive away, you can reach the stunning Château de Trazegnies.